The sails are up and from a little window from the galley we hear Coldplay sing „And nothing else compares”, something that really expresses my feelings at the moment. We started this morning at the same anchorage as were we started our cruise on Noorderlicht 15 days ago, near Alkhornet. When we approached the bird cliff of Alkhornet, to have a landing and hoping to see the guillemot chicks jump off the cliff, a whale was sighted. The captain changed course immediately and adrenaline levels soared as we saw a huge whale, greyish that showed its fluke. 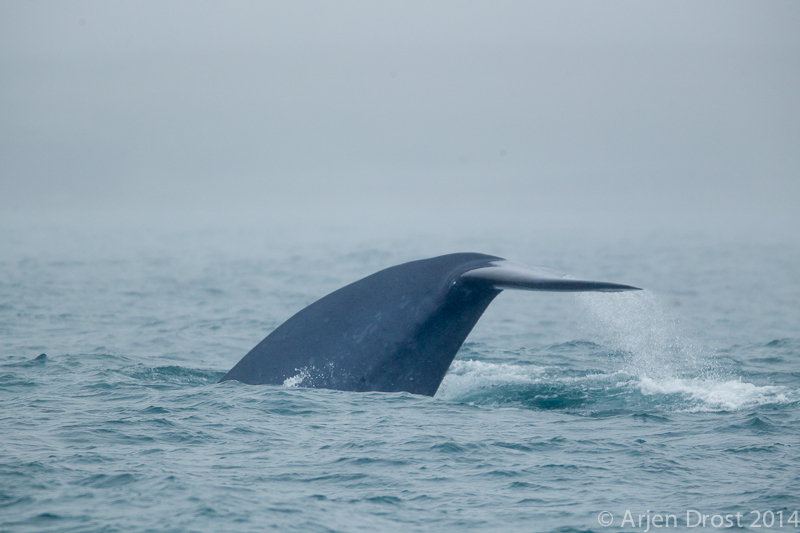 There is only one species that fits that description: a Blue Whale!! The biggest creature to have ever lived on this planet. Soon we realised it wasn’t just one whale, but at least two, one bigger and one smaller: a mother and calf! Meanwhile the bird cliff had disappeared into the fog, not that anybody was still thinking of jumping guillemots. Unfortunately the fog also covered large parts of the sea, so photographic opportunities were getting more and more difficult. In the mean time a third individual joined the feeding frenzy and they were really preforming nicely, closer and closer to the ship.